Relationships amongst Apteryx species as determined by ecological, morphological, behavioural, and molecular characters (Baker et al., 1995; Burbidge et al., 2003). Baker, A. J., C. H. Daugherty, R. Colbourne, and J. L. McLennan. 1995. Flightless brown kiwi of New Zealand possess extremely subdivided population structure and cryptic species like small mammals. Proceedings of the National Academy of Sciences 92: 8254–8258. Burbidge, M. L., R. M. Colbourne, H. A. Robertson, and A. J. Baker. 2003. Molecular and other biological evidence supports the recognition of at least three species of brown kiwi. Conservation Genetics 4: 167-177. Calder, W. A. 1979. Kiwi and egg design - evolution as a package deal. Bioscience 29: 461-467. Davies, S. J. J. F. 2002. Ratites and Tinamous. Oxford University Press, New York. Potter, M., and J. McLennan. 1992. Kiwi's egg size and moa. Nature 358: 548. Sales, J. 2005. 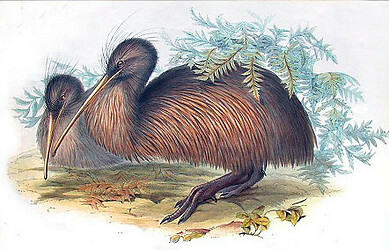 The endangered kiwi: a review. Folia Zoologica 54: 1-20. Apteryx sp., Kiwi: skull. DigiMorph. John Gould. 1840-1869. 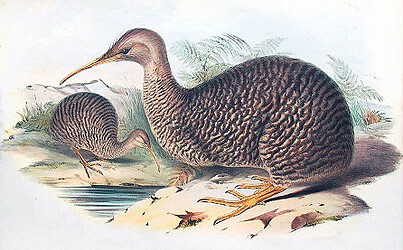 Birds of Australia. Page: Tree of Life Apterygidae. Kiwis. Authored by Joseph W. Brown. The TEXT of this page is licensed under the Creative Commons Attribution-NonCommercial License - Version 3.0. Note that images and other media featured on this page are each governed by their own license, and they may or may not be available for reuse. Click on an image or a media link to access the media data window, which provides the relevant licensing information. For the general terms and conditions of ToL material reuse and redistribution, please see the Tree of Life Copyright Policies.